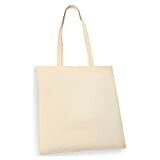 A pack of 10 strong cotton shopping carry bags, more environmentally friendly than the throw away plastic carrier bags you get at the supermarket. Reuse these again and again. The bags measure 42 x 38cm, the handles are 33cm from the top of the bag to the top of the handle. This entry was posted in Luggage and tagged Bags, Cotton, Natural, Pack, Shoppers, Shopping, Tote by Perfect Vacation. Bookmark the permalink.